NB: Each of the two separate chunks of code above is one line in the Terminal or in Remote Desktop. 1) Go to the Verizon Wireless website and follow the instructions there to delete and recreate your Voicemail speed dial option. 2) It is SUPER important to note that you cannot enter the Voicemail contact as the 10-digit phone number (the link above gives you that option). You MUST use *86 and name the speed dial “Voicemail.” Otherwise, your speed dial will work properly, but your pop-up will still dial the old number. DO NOT tie it to an existing contact. 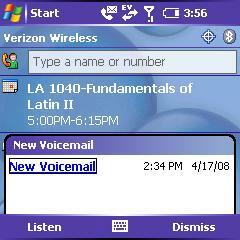 This will reset the pop-up menu to dial your voicemail number. Enjoy your terribly designed phone as much as possible! P.S. While on the phone with Verizon for this problem, I confirmed with them that there is no way to actually turn the Treo OFF. It goes into ‘flight mode,’ but as you know if you’ve ever flown, you can’t use that until 10,000ft. The solution is just what I thought: pull your battery.